Glenn McCormick unbeatable in the MX2 class at Seaforde. 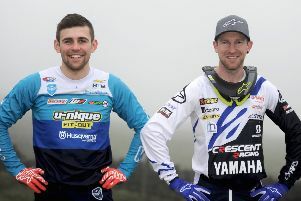 Glenn McCormick and John Meara were unbeatable in the heat at round four of the Nutt Travel MRA Ulster motocross championships at Seaforde taking maximum points in their respective classes. Glenoe’s Glenn McCormick, riding the Watts KTM was fastest in qualifying and took all three MX2 races from his nearest rival Jason Meara. His treble means that he has closed the gap to his main championship rival to 11 points after the Seaforde meeting. In the final points count it was Donegal youngster Aaron Gardiner who steered his Yamaha to third overall. “It was one of those days when everything went to plan,” said McCormick. “In superpole I was three seconds faster than everyone else which was a nice start to the day. “In my opening race I made the holeshot opening up a gap of nearly six seconds and when Jason (Meara) slipped off I just controlled the race from there and brought it home. “For race two the organisers had watered the course and it was really slippery but I decided to take a bit of a risk and it paid off with win number two. “In the final race again I made the holeshot but Jason passed me on the opening lap but I managed to repass him before the end of the opening lap and although he caught me I put the hammer down on the last two laps to win. In the MX1 Class Loughbrickland Kawasaki rider John Meara had three gate to flag wins to narrow the gap to Championship leader Richard Bird from Lisburn on his KTM to 43points, third place on the day, Portavogie Honda rider Robert Hamilton also consolidated his third in the Championship and is now only 11 points drift of Meara. “That was a good day from my point of view.” Said Meara. “They run the track the opposite road from normal and I actually liked it. The Semi Expert MX1 class produced some excellent racing with Comber man Johnny Presho winning two from three and claiming the overall while in the MX2 semi experts class Rhys Graham on his KTM took the treble win and overall. Downpatrick man Jordan Wade fired his Kawasaki to three wins in the MX1 Clubmans class with Championship rival Calvin McCorkell scoring three second places with Ciaran Boyle third overall. In the Clubmans MX2 it was a battle of the youngsters with Markethill rider Scott Baily taking the overall win on his Yamaha from Donegal teenager Ivan Kerr by 4 points with Robert Hunt third. Congratulations to the Northern Ireland Classic Scrambles Club who raised an amazing £25,000 for the charity Cancer Focus NI at their recent two days of racing classic dirt bikes around the beautiful hillside race track near Bangor, belonging to local landowner Cecil Pearson.